Probiotics 5-Pack under a microscope! Our Probiotics 5-Pack includes mini size (5-10cm) Bifidobacterium longum, Lactobacillus bulgaricus, Lactobacillus acidophilus, Lactobacillus casei and Streptococcus thermophilus. Get "cultured" with this pack of helpful bacteria found in yogurt! This is one of the most prevalent microbes in your gut. Trust your gut since Bifidobacterium longum is a probiotic, meaning it’s good for you! Human prejudice against bacterial infections is understandably widespread. But probiotics like this one perform a range of useful services such as improving digestion, helping the body use calcium and iron, revving up the immune system, and fending off pathogens. Yogurt is a probiotic-rich food, one of the oldest foods in the worlds. Yogurt is surprisingly live and active, and well-cultured too! Microbiologist Ilya Mechnikov studied the habits of long-lived Bulgarians and he attributed their longevity to yogurt consumption. He then named the primary yogurt-producing bacterium Lactobacillus bulgaricus in their honor. Just your "regular" guy, this bacteria lives in your intestines and is actually good for you! Lactobacillus acidophilus is often used in yoghurt since it’s a probiotic, meaning that it’s beneficial to your health. Yes bacteria can be good for you! 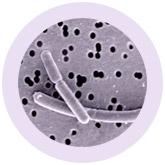 Benign bacteria such as this guy help maintain an acidic environment in your gut and discourage the growth of harmful bacteria. Here is another wonderful probiotic bacteria that is on your side – inside. Lactobacillus casei is used to make foods we love: yogurt, cheese, and other fermented milk products. When you take antibiotics, bacteria such as this one are often killed along with the harmful bacteria that the antibiotics are designed to attack. This can lead to the indigestion many people suffer when taking medicines. Fortunately, you can replace your good bacteria by eating probiotic yogurt or by taking probiotic supplements. Another probiotic microorganism responsible for this miraculous transformation of milk into yogurt is Streptococcus thermophilus. Yogurt is a Turkish word for a food that is nothing more than milk deliciously fermented by particular strains of common bacteria like this one. Yogurt has been made for at least 4,000 years, and it may be as old as civilization itself!